Smencil rolls sheets of recycled newspaper to form cylinders that serve as the bodies of the pens. 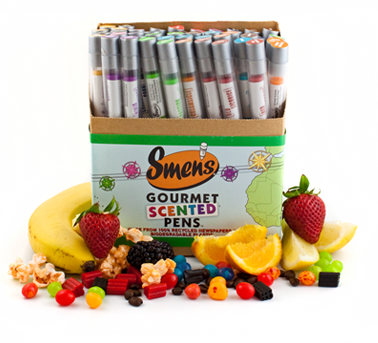 I am writing to you in regards the review that you did on our company, the Smencil Company. I had noticed that you mentioned that at the time we did not offer imprinting directly on the pencils. I wanted to let you know that now we do! Also, we now have Smens. They are pens made with gourmet scented recycled newspaper barrels that serve as the bodies of the pens. The plastic components are made with biodegradable plastics. These can also be customized directly on the barrel of the pen or on the sticker on the top cap of the pen. As far as our freshness tubes go, the reason we put them in the tubes is because you purchase the product in a bucket of 50 with a variety of scents. We include the freshness tube so the scents do not rub off on each other. The freshness tubes are made with corn based biodegradable plastics. I know that the review was written in 2008 and with the new products and product imprint changes, I wanted to see if I could send you some samples to see if you would like to review our product(s) again.